Designs in the Cheap makes quality, customizable creations for every wedding and/or event. It can sometimes be difficult finding a gift for the bride, a “thank you” gift for the ladies in the bridal party or even as a birthday present. There are those that want something special on their cakes & tables. 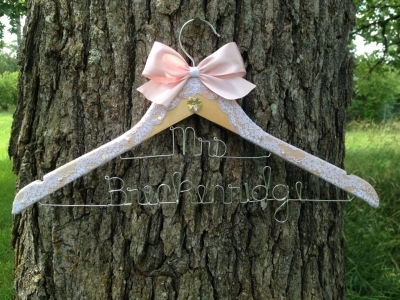 Personalized hangers, cake toppers & table toppers are the perfect addition for any wedding or event. 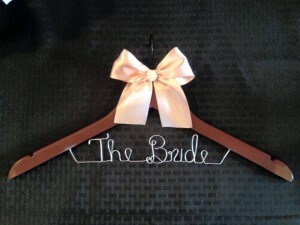 Each personalized design is created differently, customized to the preference of the bride or gift giver. Matching the colors of the wedding makes these gifts even more unique. Budgets can be tight, that’s why I offer discounts for bulk purchases. With so many wording options available & at affordable prices, it’s hard to decide which one to choose. We pride ourselves on delivering personal service with attention to every detail. Cathy is here to assist you with expert advice as you create and manage your wedding registry. If there are items on your list that you didn’t receive as gifts, we offer a generous completion program. After the wedding, save up to 20% off the regular price of most items remaining on your registry.